Travis O’Brien (left) with poles from the O’Brien & Fuerst Logging pole peeling plant, built at their Port Clements site. The plant, which has an annual production capacity of 12,000 poles, was inactive earlier this year, due to a shortage of logs. Rumours, uncertainties and hope swirled with the mists and squalls as logging contractors, specialty sawmill owners and value added manufacturers awaited details of how an unfolding new order will affect their operations on Haida Gwaii, British Columbia. But in the meantime, a reliable log supply is essential to sustaining their operations and maintaining employment had stalled. “We have no timber to run our operation,” flatly states Randy O’Brien, president of O’Brien & Fuerst Logging Ltd. based in Port Clements. The O’Briens have always sustained their operations through bidding competitive timber sales, log buying stations and from some private land owners. But timber sales have to be advertised to bid on and that hasn’t been happening recently, says O’Brien. 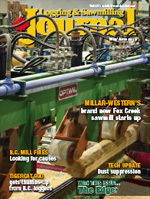 O’Brien & Fuerst Logging produces up to 3500 logs annually for house builders in B.C. and custom cuts up to three million board feet of lumber a year from wood accessed through B.C. Timber Sales. Haida Gwaii (formerly the Queen Charlotte Islands) is an outpost archipelago in the Pacific Ocean off B.C.’s northern coast. For many years the Haida have watched with increasing dismay as bargeloads of prime rainforest logs have been shipped south for processing. Methodically and patiently, the Haida have gone about reclaiming their ancestral lands and natural resources. It has been accomplished through a series of parks, reserves and other exclusions from what was the operational working forest. The Haida have acquired forest licences and been assisted by a favourable political climate. The islands’ annual allowable cut has been set at 929,000 cubic metres, down from a cut that peaked around three million cubic metres. Taan Forest, a recently formed Haida-owned company, is spearheading the reorganization of the forest industry on Haida Gwaii. The future should become clearer for the islands’ smaller operators when Taan’s house is in order and the new AAC allotted among remaining licencees. But that was not abating frustration levels at O’Brien & Fuerst Logging when Logging and Sawmilling Journal visited in April. “There’s been lots of input from the B.C. Forest Service locally, but politics seems to dictate what’s happening more than economic or social considerations,” observes Travis O’Brien, Randy’s son (see previous story). The family-owned company is no Johnny-Come-Lately, having rolled with the economic punches on the islands since 1974. It has been a consistent employer for many Haida and non-Haida islanders. During its time, the company has needed the versatility to switch gears to meet the requirements of new or different log harvesting systems and land use regulations. For example, O’Brien & Fuerst was quick off the mark on the islands to recognize hoe chucking as a low cost, environmentally friendly method of forwarding felled timber. The company has used grapple yarding methods and helicopter logging systems to meet the changing times and to access available timber. “We’ve gone through at least three or four major harvesting methods,” says O’Brien. Eventually, the helicopter logging operation on the islands had to go too. The O’Briens believe delays then in advertising new sales and resistance from major licencees exacerbated the wood supply situation. One sound move was initiated earlier when O’Brien Road & Bridge Ltd. won and still operates the privatized road maintenance contract for Haida Gwaii and the Prince Rupert area on the north coast. 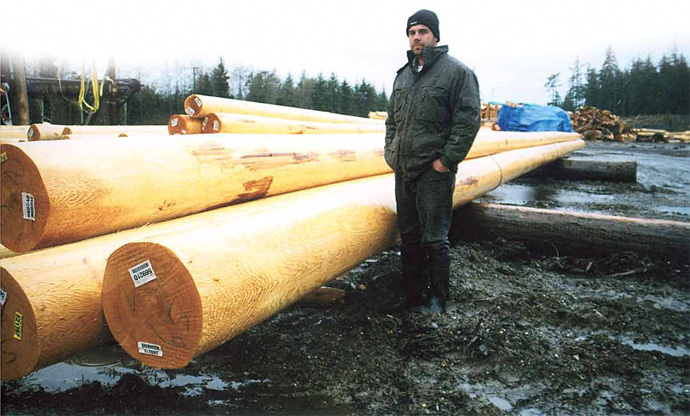 The O’Brien’s recognized the potential of western red cedar utility poles and built a pole peeling plant with an annual capacity of more than 12,000 at their Port Clements site in 2002. They also purchased a tug and barge to get their products to market on the company’s schedule and reduce stem breakages. The O’Briens aim for maximum utilization of the resource by converting the tops from poles to dowels for the organic feed market, plantations and orchards. Cedar shakes are manufactured from the pole bottoms. 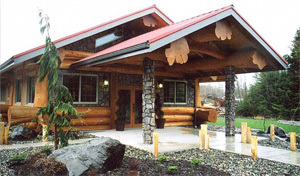 The company also produces up to 3500 logs annually for house builders in B.C. and custom cuts up to three million board feet of lumber a year from wood accessed through B.C. Timber Sales. That’s when the sales are up for bid. The company has also had success handling high value trees for end products ranging from musical instrument sound board stock to timbers and planking for sail and power boats. The pole plant was more or less inactive in April and 12 workers laid off. “Why? Because the B.C. government has decided to settle First Nations issues, legislated the market and forced us out,” says Travis O’Brien. The O’Brien’s like where they live and don’t want to see more of their ex-employees forced off island to search for work. But they say they first need a more consistent access to timber to employ more islanders, meet customer needs and develop new markets for their value added wood products. Abfam Enterprises Ltd. is a well established, family run company which operates a sawmill in Port Clements on Haida Gwaii. It specializes in the production of export lumber. But access to a dependable log supply has been an ongoing problem restricting Abfam’s ability to meet customers’ expectations. Good news for the whole north end of Graham Island was delivered last November with announcement of a three-way arrangement that would keep the mill humming and people employed potentially for years, not just days, at a time. Taan Forest—the Haida-owned company—would supply the cedar logs required. Abfam would process them using, in part, labour supplied through the Old Massett Indian Band. But the deal remained a waiting game in April. A main stumbling block, explains Jim Abbott, Abfam’s president, was financial difficulties experienced by Old Massett for its part of the 50 per cent joint venture with Abfam. Old Massett sees the Abfam deal as a way to provide employment and training for some of its people. “If they get their funding in place and Taan is successful with log delivery, we could run the mill as is to start,” says Abbott. That would allow a coherent sequencing for upgrading and rebuilding the sawmill’s equipment, a process Abbott estimates at $1.6 million.